Dark Green Religion: Nature Spirituality and the Planetary Future is a passionately written book that is ambitious in breadth and intent. The publication of On the Origin of Species in 1859 presented an alternative for understanding the world, human beings, and the place of human beings in that world—indeed, the universe—that contrasted sharply with the understanding supported by traditional religions with their beliefs in a nonmaterial being or beings (Darwin, 1859/1979). The author, Bron Taylor, observes that in the 150 years since Darwin’s publication a spirituality has been evolving to accommodate this cognitive shift that is more congruent in its recognition of an ecocentric and nonanthropocentric perspective informed by evolution. He sees traditional religions as on the defensive, and, where they are not, there has been an accommodation to nature religion and an evolutionary point of view (for an example, see Davis, 2008). 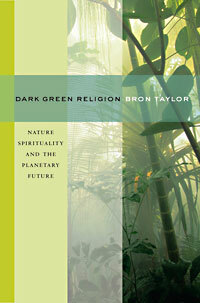 Bron Taylor’s key “argument is that this kind of ‘nature religion’ is far more prevalent and important than is commonly recognized,” and his objective “is to provide the reader with the lenses needed to see dark green religion for themselves, to recognize its growing importance, and to consider its implications” (pp. xiii–xiv). The book is organized into nine chapters, each addressing important aspects of the author’s program to investigate, understand, and make visible the basic processes giving rise to dark green religion and to chronicle its gradually evolving visible solidity. The first chapter attends to establishing the general methodology and definitions needed to address what Taylor sees as “dark green religion,” while the second examines exemplars of four different types of nature religions. Taylor first separates the definition of religion from the belief or acceptance of nonmaterial spiritual beings and develops the rationale to use what he refers to as a polyfocal approach for examining nature religion that relies on “family resemblances” that are dimensionally congruent in beliefs and practices, rejects the presumption that any one trait or characteristic, such as a belief in God, is essential to religion, and identifies the “explanatory power” of “religion-resembling beliefs and practices” (p. 2). Taylor develops the term bricolage to denote the eclectic hybridization and amalgamation of diverse and sometimes disparate ideas, practices, religious traditions, and political ideologies that cohere and fuse together with sometimes surprising ease. Taylor begins the history of Dark Green Religion with Baruch Spinoza and Jacques Rousseau, especially noting Rousseau’s conviction that people in a state of nature who are “uncorrupted by society have a natural predisposition toward sympathy and compassion for all creatures” and a belief that “one’s own identity includes the rest of nature” (p. 9). He identifies four types of green religion: spiritual animism, naturalistic animism, gaian spirituality, and gaian naturalism (p. 15). The distinction between spiritual and naturalistic is that the former implies a supernatural and immaterial dimension in the perception and relation to nature, whereas the latter adheres to a more agnostic and scientific perspective without the need for immaterial connections that might be described as pantheistic (Skrbina, 2005, pp. 15–19). Animism and gaian earth religion are intended to capture those naturalistic ideas and practices that will distinguish these two types of nature religion. Spiritual animism and gaian spirituality are meant to capture those ideas and practices that reflect a pantheistic, direct connection or harmony with nature. The term gaian as used in the author’s taxonomy is credited directly to James Lovelock, who occupies a central part in the story (Lovelock, 1987). Animism refers to the accounts of individuals who describe experiences of being in direct communication with animals and sometimes other beings such as trees. This sets the methodology by which the author examines the nature religion movement. Henry David Thoreau was the first American apostle of nature religion and developed nearly all of the principles present in what can now be described as the ecocentric nature religion movement. These include (a) a dedication to a simple, natural, and undomesticated life of freedom; (b) the conviction that wisdom and knowledge come through direct experience of nature; (c) an emphasis on the idea that a sense of belonging to nature can be seen as religious; (d) the concept that justice and the laws of nature are derived from harmoniously living in nature; (e) the adoption of an “ecocentric” or “biocentric” perspective in contrast to a Christian-promulgated anthropocentric perspective that has led to the destructive dominance of nature currently witnessed; (f) loyalty to the interconnectedness of nature; and (g) belief in the necessity of human moral, spiritual, and (even) scientific growth. The beginning of the American awareness of an ecocentric perspective and development of sympathetic life practices is powerfully credited to Thoreau so that Taylor continues his narrative with a section titled After Henry David Thoreau. The ecological “saints” discussed by the author include Aldo Leopold, who is considered America’s greatest environmental ethicist; John Muir, whose life and writings significantly contributed to the American national park system; Jane Goodall, whose complex animism and scientific contributions in the study of chimpanzees inspired a lifestyle; James Lovelock, for giving scientific form to biocentric spiritual practices; and Rachel Carson, for creating one of the first biocentric voices. Radical environmentalism took form during the 1960s and created a dramatic environmental apocalypticism of active martial sabotage of both property and of hope. It is why Taylor uses the word dark to preface “green religion.” Dark metaphorically refers to a deep green and to deep commitment, on the one hand, and to the danger that, in its radical form, nature religion can ignore individual rights and impose its convictions without consent, that is, violently, on others. In its radical form, it appears to offer a justification to use violence to defend the environment that is not different from the justification of violence in other forms of radicalism. The radical environmental movement has resulted in many acts of heroism, from the perspective of dark green religion, and some of the most forceful and elegant statements of the environmental movement. Taylor carefully examines and guides the reader through the history and literature of these somewhat disparate movements. In one chapter, “Surfing Spirituality,” the deep spirituality that is connected to the water and to surfing, along with its history, is developed. The stories of its heroes, or saints, illustrate the spiritual depth of the practice of surfing that can bring a large range of benefits to its practitioners, including physical, psychological, cultural, and spiritual healing (p. 125). One chapter, “Terrapolitan Earth Religion,” adds a new and broader dimension to the author’s study by describing the 2002 UN World Summit on Sustainable Development that took place in Johannesburg, South Africa, and the resulting development of the Earth Charter (Earth Charter Initiative). The World Summit on Sustainable Development, in the author’s perception, was a beginning effort to “make sustainability the axial social organizing principle of human civilization” (p. 181). The Earth Charter (http://www.earthcharterinaction.org/content/) is considered to be an early attempt at drafting a sacred text for a “proffered terrapolitan earth religion” (p. 203). The author summarizes his study with the statement that “by now this much should be clear: dark green religion is no phantom” (p. 195). He asserts that both the traditional religions that see the sacred as beyond and transcendent to the world (e.g., Christianity) and those that view the world as sacred “understand these world views to be incompatible” (p. 206). Taylor is relatively successful in bringing together the bricolage of materials to give a visible shape to dark green religion. He is convincing in the assertion that nature religion is a significant social force that will inevitably continue to grow in influence and social power. His discussion of terrapolitan earth religion makes use of the contrast to the Abrahamic religions and broadens the relatively narrow Western European and American perspective, especially in his description of the World Summit on Sustainable Development, which involved the participation of indigenous peoples and of a lay Buddhist organization, Soka Gakkai, resulting in building a more genuine world perspective. It may be that of the five principle axial age religions, the general worldview of Buddhism (see Armstrong, 2006) is most compatible with the dark green religion as described by Taylor.